The Downtown Albany Business Improvement District (BID) will be joined by business owner William Yager and elected officials to officially open Lucky Cat Laundromat, located at 133 Madison Avenue in Downtown, on October 13 at 2:00 PM. The state-of-the-art facility is the latest venture for Yager, whose other Tragic Empire businesses include Albany Modern Body Art, Patsy’s Barbershop, Patsy’s Pinups, and Shocker Tattoo, all located in Albany. As our Downtown neighborhood grows, we need businesses that meet the needs of our newest residents. 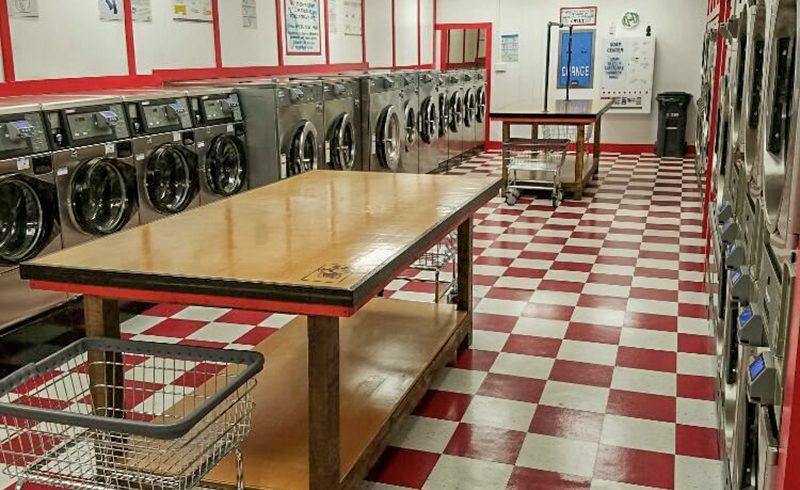 This full-service laundromat fills a niche for a very basic but essential need for those making Downtown their home. Yager invested approximately half a million dollars in purchasing, renovating, and outfitting the 2,900-square-foot building. The facility, which has 12 on-site parking spots, gives customers the option to pay for laundry using a debit or credit card, or right from their smart phones, saving them the time of scrounging together quarters. The high-tech machines offer another benefit as well; paired with the 20-camera security system put in place, if a customer runs into an issue with a machine after paying, Yager has the ability to view the facility from his phone, and can remotely start a different machine so customers simply transfer clothes and continue doing laundry. Having done significant research prior to opening the business, Yager invested in top-of-the-line Huebsch stainless steel washers and dryers, a cost of approximately $211,000. As a result, customers are able to take advantage of low-suds, high-speed machines that use less water – Yager noted the 60lb washing machines use just 3 gallons of water, compared to 15 gallons in a typical machine found in laundromats. The energy efficiency doesn’t stop at the machines however; the building also utilizes led lighting throughout, and the owner seeks to obtain LEED certification for the building. Named for Yager’s love of cats, the Lucky Cat logo incorporates Maneki-neko (“beckoning cat”), a common Japanese figure believed to bring good luck through a waving paw. Extending beyond the logo and name, plans include fundraising, and possibly adoption, events for various cat rescues in the area and, longer term, the creation of a Lucky Cat Foundation which will help support organizations that rescue, foster, and provide medical care for felines. The business comes at a time when Yager saw the quickly expanding residential population and sought to give people a better option for washing larger items, such as bedding, that the machines in their building can’t accommodate. Amenities at the laundromat, which has an attendant, include a Loyalty Card which gives customers a 10% bonus when at least $20 is added to the card; delivery and drop-off, dry-cleaning, and wash and fold services and; an app that will allow users to pay from their phone. Future plans include a Laundry Happy Hour which will include free detergent at certain times. Lucky Cat Laundromat is located at 133 Madison Avenue. Open 7 days a week, 7:00 AM to 10:00 PM. For more information, call 518.977.3105 or find them on Facebook.